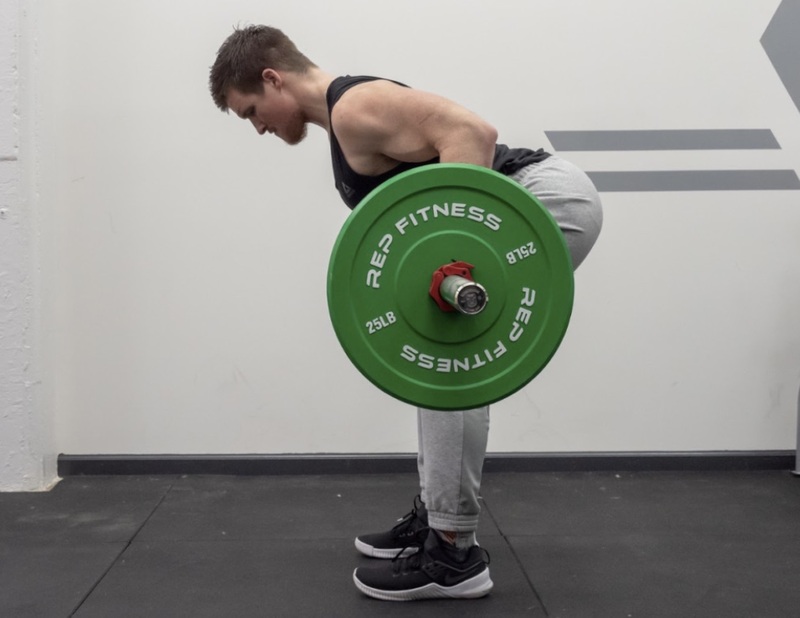 In this article we will discuss the bent over row, a compound lift that can increase overall strength and muscle mass of the back muscles and can play a significant role in deadlifting and pulling performance. Who Should Do Barbell Rows? Grip the barbell with a grip that’s similar in width to your deadlift, or slightly wider. Once you’ve established your grip, lift the bar off the ground and bend over maintaining a strong set back and hip hinge. Make sure you start with a weight that is manageable to move with proper back and hip angles. The stance chosen should be similar to what is used in your deadlift, but it may vary. Find the stance that feels most comfortable and allows your to maintain a strong hip hinge and set back. Once your stance, grip, and back/hip angle are established, then it’s time to initiate the row. When beginning the pull, think about bringing the elbows back as if you’re starting a lawnmower, and focus on utilizing the latissimus dorsi to move the weight. Coaching Tip: If the weight is causing you to drop your chest or the elbows are flaring, then it may be too heavy and the weight used should be scaled back. At the top of the movement, squeeze the full upper back and contract the lats without breaking your hip angle and set back. Think about pulling the barbell fully to the body to ensure you’re fully contracting the upper torso’s musculature. Coaching Tip: If you’re looking to improve hypertrophy with the barbell by increasing time under tension, then try adding a pause at the top of the movement (full row), or slow down the eccentric (lowering portion). In the below video the bent over row is demonstrated, which can be performed with barbells, dumbbells, or other weighted means. The bent over row is a classification of back exercises, which can also include single arm bent over rows as well. Note, that in the below video demonstration, the barbell bent over row is performed. This is slightly different than a Pendlay row, which was discussed in detail in a previous article. 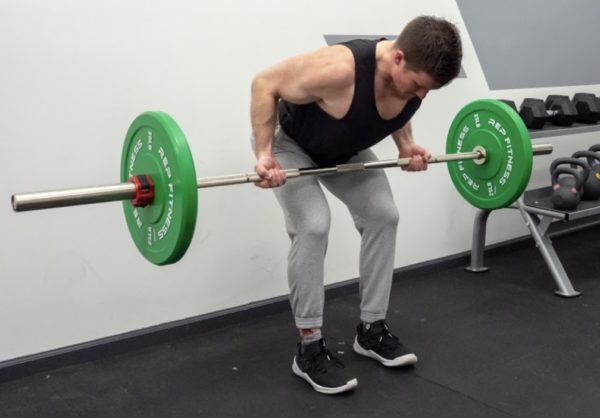 In this section we will discuss three benefits of the bent over row that coaches and athletes can expect to gain when adding these into training programs. Building a strong and broad upper back is key for most power, strength, and fitness sports, not to mention filling out that XL shirt. A strong back is a great indicator of overall strength, often allowing us to pull, squat, and even press greater loads. The bent over row allows a lifter to move significant amounts of loading using the back muscles and build strength and muscle mass; which can most certainly be applied to pulling, squatting, and pressing movements. Movements like deadlifts, back squats, and pulls (cleans, snatches, farmers carry, etc) all require large amounts of force production in order to move, hoist, or stabilize the body in certain positions. The back muscles (as well as the lower back, hips, and hamstrings) are all called upon when in the bent over position, which is similar across various angles of rows, deadlifts, and pulls from the floor. While the bent over row may not match the identical angles that the torso is in during specific movements like the clean vs deadlift; it can have a broad carry over for increasing general strength and positional stability to allow for greater pulling performance. As discussed above, the spine is put into a position that matches many strength movements from the floor during the bent over row . WIthout proper strength, stability, and awareness of one’s body in space and/or the ability to resist lumbar flexion the athlete may find themselves in compromised positions that can result in injury or lack of performance. Movements like the bent over row help to increase general strength of the back (upper and lower) and reinforce proper spinal control and resistance to lumbar flexion under load. The bent over row is a compound exercise that stresses high amounts of muscle tissues when performed correctly. While it is a rowing motion (meaning it targets the back muscles) it still can have significant muscle building effects on other muscle groups. The below list covers the primary and secondary muscles worked when performing bent over rows. Below are some reasons why strength, power, and fitness athletes can benefit from performing barbell rows. Strength and power athletes can benefit by using barbell rows because they can produce carryover to competition lifts. Since the barbell rows is considered a compound exercise, it’s a useful movement to add to back days, or as a supplement for pulling movements. The barbell row also helps load the upper back musculature in a manner than some forms of deadlift cannot, which makes it a great exercise to build strength and promote hypertrophy. There’s no denying that a strong back will lead to successful workout and competition for functional fitness athletes. The barbell row is an awesome way to build back strength and promote muscle growth for functional fitness athletes. Ideally, the barbell row will be used as a supplemental movement for this athlete, as their main focus will most likely be on exercises often programmed in workouts. If an athlete notices that their back is lagging and that’s the first part of the body that fails on movements, then barbell rows may be the trick to bring their back up. Besides the obvious benefits of increased back strength and hypertrophy, the barbell row can be incredibly useful for any level of fitness. This movement helps reinforce strong hip hinge mechanics, along with supporting one’s ability to set the back. If you’re brand new to lifting, then perform barbell rows very light and focus on form and tempo to ensure you’re achieving their full benefit! Below are three primary training goals and programming recommendations when programming the barbell row into workouts. Note, that these are general guidelines, and by no means should be used as the only way to program pull-ups. Tip: Try programming these after your main compound, or as a main compound. Tip: Adding a pause at the top or performing a slower tempo is a great way to increase your muscle’s time under tension. 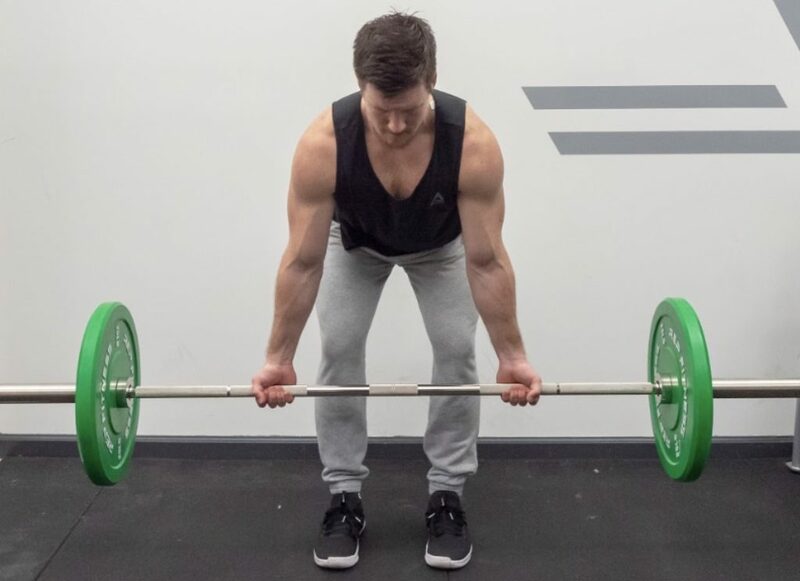 In this section we will briefly discuss four popular bent over row variations that coaches and athletes can use to build back strength, muscle and pulling/squatting/pressing performance in power, strength and fitness athletes. This is the most popular variations of the bent over row, which has a lifter assume a bent over position (to varying degrees based on angle emphasis) while keeping a barbell close to the body. The barbell row allows for the greatest amounts of loads to be rowed, often inducing high amounts of muscle damage and transferability to heavy pulling movements. The dumbbell bent over row is done with a dumbbell held in each hand, assuming the same bent over positioning as in the barbell bent over row. The lifter can manipulate the amount of pronation/supination of the wrist to target slightly different angles and muscles in the back/posterior shoulder. This can help to address muscle imbalances or offer increased ranges of motion to the bent over row. The kettlebell bent over row is a very similar to the dumbbell bent over row. It allows a lifter to address any asymmetries in strength and muscular development. In addition, it can be used to increase range of motion in the row to increase muscle contractions and growth. While the bent over row is often thought to be with a barbell, it can also include single arm variations (unilateral). Movements like the dumbbell bent over row, or also called the single arm row, can work many of the same muscle groups yet offer the unilateral benefits that coaches and athletes seek. Take a look at some of the articles below to learn more about back training for strength, power, and fitness sports.